The Dubai Frame is due to open later this year – even though an ongoing lawsuit filed by its architect, Fernando Donis, alleges the design is stolen. The Rotterdam-based architect won an international competition for the project nine years ago, organised by the Dubai Municipality and German company ThyssenKrupp Elevator. Beating over 900 entrants, Donis' proposal – also named the Dubai Frame – featured two parallel towers linked by an observation deck, a similar shape to a temporary landmark the architect had previously designed for London. Measuring 150 metres high and 93 metres wide, the structure is now rising tall in Dubai's Za'abeel Park, with its completion slated for the end of this year. According to the New York Times, Donis has filed suit in US federal court against the Dubai Municipality and ThyssenKrupp Elevator, claiming he never received either a contract or compensation for his design. "Such copyright infringement to an important international competition regulated by UNESCO-UIA undermines the intellectual work of not only the 926 participants of the competition but all practicing architects," Donis told Dezeen. "We hope that by making the story public, awareness is raised and more respect is achieved to the discipline in the future," said the architect, who filed the lawsuit in 2016. The Dubai government has dismissed Donis' complaints because he received a $100,000 (£81,800) prize for winning the competition. But the rules of the contest had stated the architect would keep his copyright and that his design would only be used after he had signed a contract. "The author of the preliminary design placed first will keep his copyright and his work may only be used by the Dubai Municipality when he has signed the corresponding contract," it read. Donis claims he was contacted in 2011 by Roxy Binno, a representative of the Dubai Municipality, who said his copyright covered only the "conceptual design" and that the municipality had the authority to proceed without a signed contract. The architect continues to refute this, and is being represented by New-York based Klaris Law. "Donis' design is protected," said Klaris Law associate Alexia Bedat. "His design is registered with the US Copyright Office and is protected under international copyright law." "Throughout the world, copyright protection attaches upon creation of the design, no further act is needed." The firm has served the complaint and is waiting for a response from the Dubai Municipality and ThyssenKrupp, which are located are in the United Arab Emirates and Germany, respectively. Designed to outline views towards the Emirates Towers and Burj Khalifa on one side and the Deira, Umm Harare and Karama from the other, the Dubai Frame will include an exhibition gallery and museum. A panoramic elevator will take visitors up through the rib of the frame to the top floor, where they will be able to look over the Dubai skyline. Earlier this year, the magazine Arabian Business reported that construction had been delayed because of problems with the cladding. The official opening was originally planned for 2015. In 2015, Dezeen reported that Dubai was entering into its "next wave of development" after bouncing back from the 2008 financial crisis, which halted many of the ambitious building and infrastructure projects – leaving many towers half-built and highways unfinished. 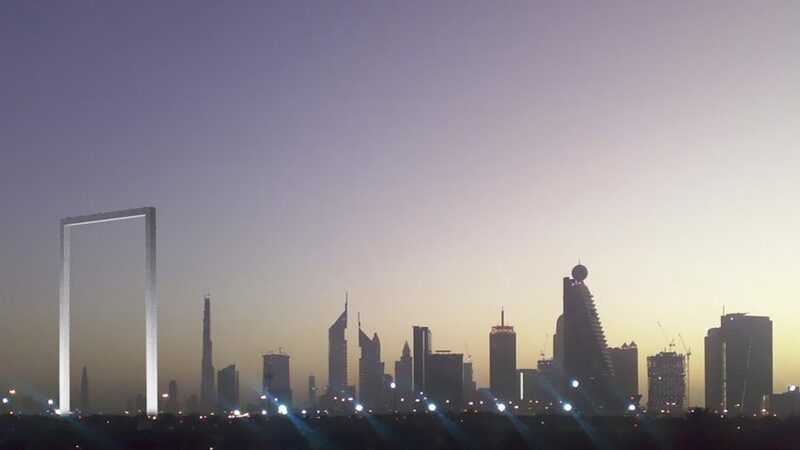 The city was bailed out by neighbouring emirate Abu Dhabi, which led to the renaming of the world's tallest building – the SOM-designed Burj Khalifa – after its emir.